Every Keith Urban fan wants to know the facts behind the man, a Keith Urban biography, if you will. The talented singer, songwriter, and record producer has long been one of the favorites in the country music world, and getting to know about this legend is a necessity. And while his net worth may be over 75 million, this 51-years old artist never ceases to lose his grip on reality and being relate-able to the public, which is why so many want to know more about Keith Urban bio. He was born to Marienne and Robert Urban on October 26th, 1967. He is the youngest of two sons, his older brother being Shane Urban. 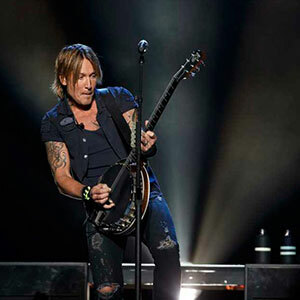 Growing up in Caboolture, Queensland, Australia, Keith Urban parents ran a convenience store, which is where Keith first started receiving guitar lessons. From there, a spark lit under him and he had an undying passion that would eventually lead to his success in the music industry. Keith Urban one his first country music talent show when he was only eight years old, an impressive award that would foreshadow the success of the country music star, who created his first band in Australia in 1988. From there, he decided to take his country music career one step further and headed off to Nashville, Tennessee in 1992, where the Ranch band was formed. This group eventually signed on a record deal in 1997 and released Keith Urban's first album, The Ranch. From then on he began making more Keith Urban albums, including "Golden Road" in 2002, "Be Here" in 2004, and "Love, Pain & the Whole Crazy Thing" in 2006. Some of his most popular songs to date are all songs that we know and adore. The two most popular songs include one of the first Keith Urban songs "But For The Grace Of God", and more recently "Somebody Like You" and "Who Wouldn’t Want To Be Me". Keith Urban has been married to actress Nicole Kidman since June 25th, 2006. Now the pair has two daughters Sunday Rose and Faith Margaret. The Keith Urban's family lives in a large home located in the Nashville, Tennessee area. Keith Urban has earned an ample amount of awards since his beginning career years in 2001, leading all the way up to 2018. The first award he was rewarded was at the Academy of Country Music Awards, leading Top New Male Vocalist in 2001. More recently he earned the CMT Music Awards for Performance of the Year for two songs: ‘The Fighter’ featuring Carrie Underwood and “I Won’t Back Down” featuring various other artists. There is so much more to learn about this caring, fun-loving, and talented country singer. There simply are far too many Keith Urban facts to fit into a single bio! But every true fan will know that these are the basics when it comes to a Keith Urban bio you need to know.